Did you know that the query "How to draw a cat" generates 40 MILLION results if you ask Google. Interestingly if you query "why we draw cats" Google becomes deaf and pretends it hasn't heard and serve up more takes on "how to draw a cat". I think the reason people draw cats is because we own cats - lots of them! There's about 7.5 million in the UK and where I live there's about 600 cats per square mile. We also draw cats because when we've fed them they lie down and stay pretty still for rather a long time - and it's a lot easier drawing a cat which doesn't move! ....and because we love them. I can't believe it's a year. I still miss him every day. I still get tearful when I try to talk about him. One year ago right about now we were taking him to the vet for the last time - and then brought him home again for some last drawings of his last sleep. It seems this year as if rather a lot of people I know have also lost their cats. I've watched as new kittens have arrived - but I simply haven't been able to replace him (and not just because Somali kittens are very difficult to find!) but simply because he is totally irreplaceable. What I do know is that I wouldn't be without all the drawings I've got of him. 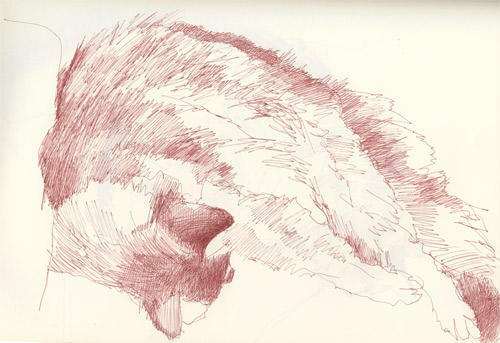 I look back through sketchbooks and suddenly there's yet another drawing of Cosmo - usually half finished because he decided to move while snoozing. I've found it difficult drawing in the last year. Did I not tell you all that Cosmo has to sit right next to me and watch while I draw? And if I show the slightest inclination to pause and reflect and not remain alert to his likely next move, he's climbing into my lap - right across the artwork. THOUGHT FOR THE DAY: Always draw the ones you love - because you never know when they're not going to leave you. 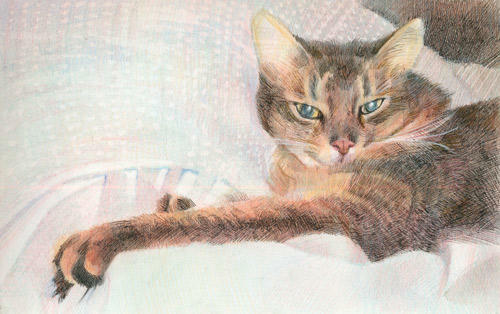 Lovely drawings of beautiful cats. 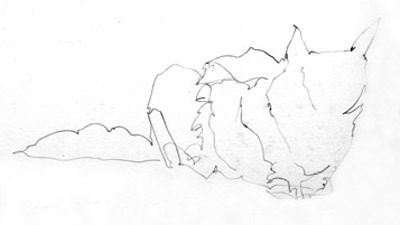 Dogs are always on the move and consequently I have very few paintings or drawings of mine. Whenever they're out they want to come in and visa versa, always in a mad rush! Cats just sit next to the French Windows - and want to be the other side. So you let them out. Then they sit the other side staring through the glass accusing you of leaving them out in the cold. So you get up and let them back in - and they dash off! You're so right about drawing the people and things that we love. You've got some wonderful drawings to bring back memories of Cosmo. 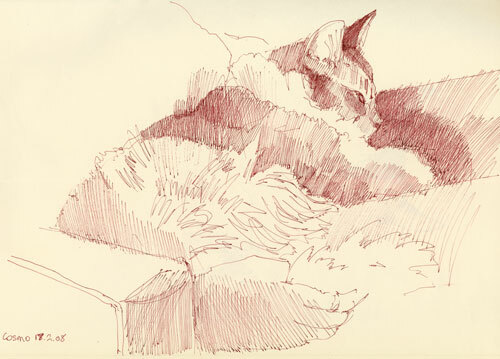 I lost my Nat cat in April and love looking at the sketches I have of him - many half finished because he moved. They are so much more him than photographs. Thanks for the reminder to draw all of those we love. Sorry to hear you lost a beloved pet and friend. 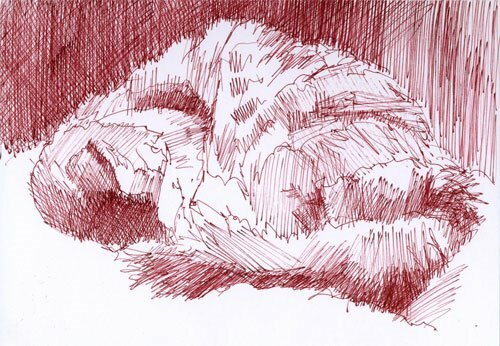 I'm a cat person as well and have made several drawings of pets as they're sleeping, and also had to leave several unfinished, as the models decided they needed to move, leave, or change position. It's so telling that we love our animal friends so much--I think in my case, more than most people in my life AND they've certainly helped me refine my drawing skills. I found your comments,and your beautiful drawings,very poignant and moving. Like you, I lost my beloved Biscuit a few months ago and never imagined how hard it would be. And you are so right about drawing those things you love. Thank you for a lovely post. All my sympathy and empathy, Katherine...I still miss my Scoutie and she's been gone almost 10 years. We do have others, and I love them dearly (and draw them often), but they're all unique, aren't they.